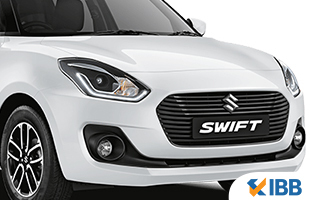 LXi/LDi- These are the entry-level petrol and diesel variants of the 2018 Swift respectively. The price range is Rs. 4.99-5.99 lakhs (ex-showroom) and the features on offer include 5-speed manual transmission units, ABS with EBD, brake assist, ISOFIX child seat mounts, dual-front airbags, 165/80 R14 tyres, body colored bumpers, engine immobilizer, tilt adjust steering, gear shift indicator, internally adjustable rear view mirrors, instrument cluster with amber backlight, manual air conditioning and heater, remote fuel lid and boot opening and more. VXi/VDi- These are the mid-range trims of the 2018 Maruti Suzuki Swift which are priced between Rs. 5.87-7.34 lakhs (ex-showroom). Key features include 5-speed AMT or manual transmission options, a security system, adjustable day-night rearview mirror, speed sensitive door locks, white backlit instrument cluster illumination, body colored wing mirrors with turn indicators, body colored door handles, keyless entry, tachometer, outside temperature display (AMT), electrically adjustable rear view mirrors, power windows, automatic driver’s side down feature, central locking and height adjustable driver’s seat. Other features include adjustable front seat headrests along with a driver’s side footrest which is only available for the AMT trims. There is a rear parcel shelf in tandem with the gearshift indicator which is available only for the manual transmission trim. There is a four-speaker audio setup with Bluetooth, AUX and AM/FM. There is also remote keyless entry. ZDi/ZXi- These are the higher trims and get 5-speed manual transmission and AMT options in tandem with 185/65 R15 tyres, 15-inch alloy wheels, reverse parking sensors, leather-wrapped steering wheel, front fog lamps, two tweeters, smart key with push-button start, front fog lamps, electrically retractable outside rear view mirrors, automatic climate control, rear washer and wiper, rear defogger, boot lamp, 60:40 split rear seat and adjustable rear seat headrests. These are the extra features that are available for these two variants. ZXi+/ZDi+- The top-end models get 5-speed manual transmission options and are priced between Rs. 7.27-8.29 lakhs (ex-showroom). There are 15-inch alloy wheels with dual tone finishing, LED daytime running lamps, LED projector headlamps, reverse parking cameras, SmartPlay touchscreen infotainment systems with Android Auto and Apple CarPlay compatibility and automatic headlamps with the follow me home feature. These are the exclusive distinguishing features of these two top-end trims.